February 23, 2016 By This post may contain affiliate links. This St. Patrick’s Day enjoy a slice of brightly colored Rainbow Cake Roll filled with Rainbow Chip Frosting instead of searching for that elusive pot of gold. 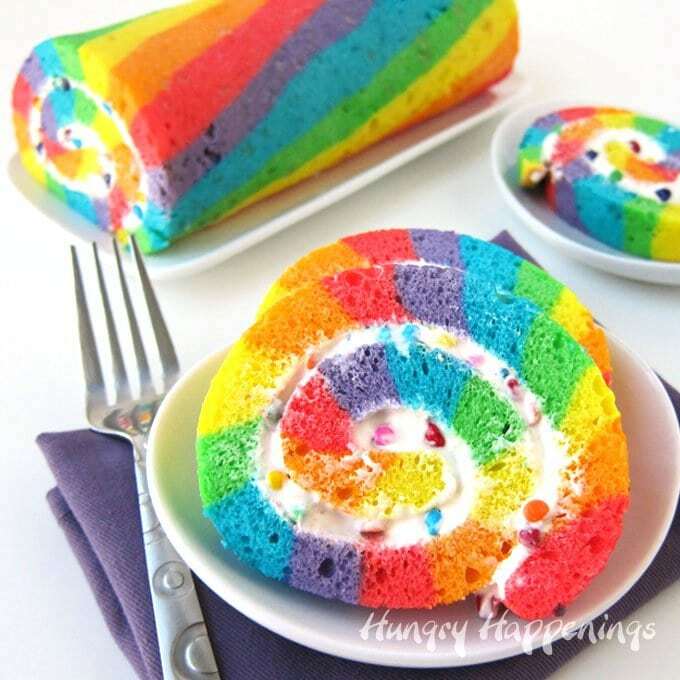 It’s very unlikely you will find a pot of gold at the end of the rainbow, but you can find a sense of satisfaction by indulging in a sweet treat like this brightly colored striped cake roll. I know it’s not the same, but eating sweets always makes me feel prosperous. It’s hard to imagine life without cake or cookies or pie or ice cream or candy. If I had to chose a life without them over a pot of gold, I’d choose dessert. I’m getting pretty good at making cake rolls being I’ve made several for my gig over at Tablespoon.com. They look so simple, yet can be challenging to make without cracking. What I’ve learned is that the cake can crack a little as long as that crack get’s rolled up inside and wont show. So, I worry a lot less now when I make these types of cakes. This is my favorite cake roll creation to date and everyone who enjoyed a slice loved the bright stripes of color throughout the cake. 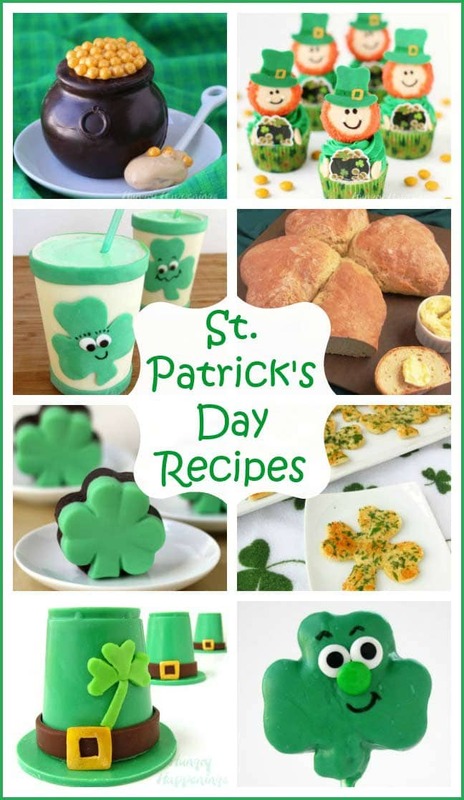 It’s the perfect cake to serve for St. Patrick’s Day, but would also be fun for Easter or a birthday celebration. You can check out the recipe and step-by-step tutorial at Tablespoon.com. 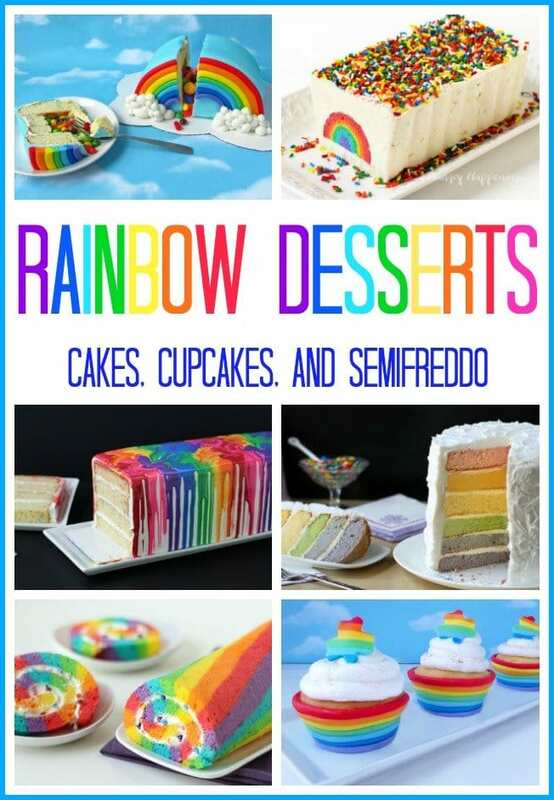 Brighten up any celebration with these Rainbow Desserts. Love the colors. My fav is the drippy one.